Having been a coffee (and cake) addict for as long as I can remember, without a day going by where I don’t get through the morning with a steaming cup of the hot stuff, I was super excited when TASSIMO contacted me with a lovely offer to test out their TASSIMO My Way brewer machine. I usually drink around three cups a day so knew that I’d 100% be able to put it through its paces and see if it could keep up with my coffee addict ways. In our house we drink everything from black coffee to lattes, hot chocolate to cappuccinos, so in other words no milk to virtually all milk. 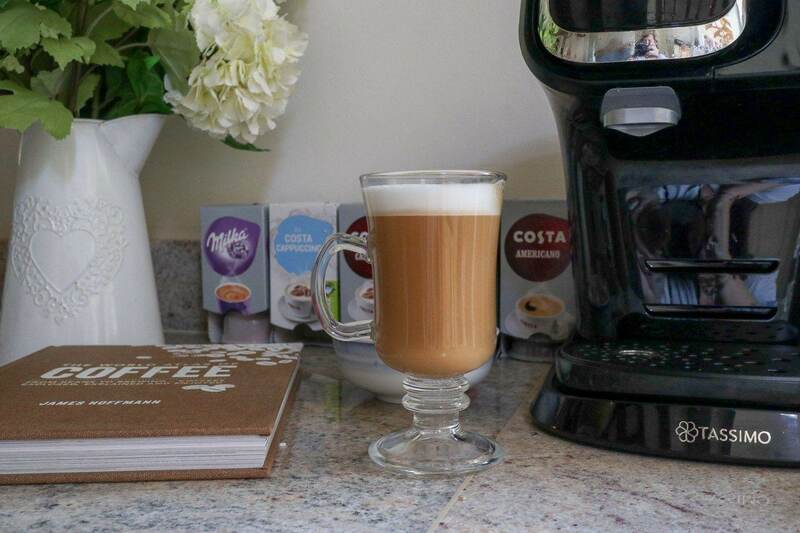 That makes an automatic milk frothing home coffee maker a no brainer – so the Cappuccino choice on the TASSIMO My Way brewer is perfect for me. I love a bit of froth! It’s near impossible to have a one size fits all approach to how people like their coffee so one thing I found appealing was the fact the machine was so multi-functional, and not just in regard to the type of coffee you like. Long, short, hot, warm, strong… the options are fantastic but somehow manage to still keep the machine very simple to use and easy to understand. Ease of use is important, and this thing absolutely cannot get any easier to use. Through a very clever ‘Intellibrew©’ system, you can have the perfect cappuccino, latte macchiato, or any other coffee variation you would like at the touch of a button. For me I also loved that it didn’t take up too much space on my worktop, looked smart and wasn’t an eye sore in the slightest. Neither did it make too much noise so no worries about waking everyone up when I need an early morning cup. Some evenings I’m up really late working on a wedding cake and I still need to get up around 6am to carry on baking or make deliveries. Coffee is my best friend! Tied in with school runs, morning routines and errands to run, the one thing that I crave, aside from my coffee hit, is convenience. Currently I grab my Keep Cup, move the tray up to the middle, pop in the Americano T-DISC, add a splash of Oat Milk, press the medium strength button and off we go! 90 seconds later my coffee is hot, smells delicious and is ready to go. I know a few of you cake makers will be reading this and you’ll know exactly where I’m coming from! This weekend I was teaching a cake decorating class at The Cake College and being the social person I like to be, I took the TASSIMO machine along with me to get some second opinions. We made Cappuccino’s, Espressos, Hot Chocolate, (with marshmallows of course) and had a really good play around with the machine. Drinking coffee isn’t just about drinking the coffee, right? It’s about the entertainment and the social side of being with your guests and friends – playing hostess with the mostest is lots of fun. The TASSIMO machine is actually a little different to any others that I’ve seen as there are two capsules for each drink allowing you to make the entire drink from the disc. So, if you want a Latte for instance, you put in the milk disc, press the button, then put in the coffee disc, press the button – voila! Each drink’s unique bar-code will give your machine all the information it needs to create the perfect cup. No extra little frother for the milk. No having to buy a little pot and warm it on the side, this is all done by simply popping in the pods and pressing a button. But, you don’t have to use the milk. If like me, you prefer a dairy-free milk alternative, like oat-milk for example, you can simply use the coffee pod and add whatever you prefer. It’s again all about personal preference and this machine works perfectly fine with that. A few comments from the lovely ladies on Saturday’s class were that the coffee had a really nice strong flavour and that it tasted really fresh too. Another liked that it was actually hot, rather than just lukewarm like some machines they’d tried, but overall everything was positive, mostly on how it easy the machine is to use and how nice the coffee tasted. Now, it goes without saying that my one reservation about using this machine was what happens to the pods? It’s the one and only reason I’ve not used one before. So it was the perfect opportunity to do a little research. I don’t think I could comfortably ever use the machine without knowing that there was some ecological way to recycle the plastic. And there is! Terracycle have it sorted. The programme is run by a network of volunteers who have set up dedicated collection points at public locations across the country. There’s at least six near me meaning I can just box them up and drop them off. The TASSIMO T-DISCs, foil wraps, and even the outer packaging, are cleaned and melted into hard plastic, which is then remoulded to make new recycled products. This isn’t just a UK thing either. If you’re reading this outside of the UK, it’s a fantastic Worldwide scheme, and you can in fact recycle more than just coffee pods too. You can pretty much buy the TASSIMO My Way brewer at most high-street retailers and electronics shops. Amazon have it too, and the pods are also on there, just for ease. What do you think? Ready to give it a whirl? Do you have one already?